Adolphe Sax, son of cabinet-maker Charles Joseph Sax was born November 6, 1814 in the town of Dinant in the Meuse valley in Belgium. Though christened Antoine, he preferred to be called Adolphe. He was the eldest of eleven children, eight of whom died during an epidemic. His father, Charles, turned his mind to the manufacture of musical instruments, creating brass instruments, bassoons and clarinets of such high quality that he was appointed Instrument Maker to the Court of the Netherlands by King William I. Needless to say, Adolphe followed in his father’s footsteps. Adolphe’s practical musical education consisted of studying voice, flute and clarinet, the latter instrument on which he was reputedly especially adept. Equally important to his career as an instrument-builder was the fact that his father pioneered research into the placement of holes in a tube in order to gain the best possible intonation. From 1840 to 1844, Adolphe worked on the instruments that were to be called Saxhorns, a term said to have been coined by John Distin and his four sons. The Distins were famous virtuoso musicians who for many years played, toured world-wide and promoted Sax’s creations. One of the sons, Henry, eventually became a famous instrument builder in his own right. Adolphe first exhibited his Saxhorns in Paris in 1844. 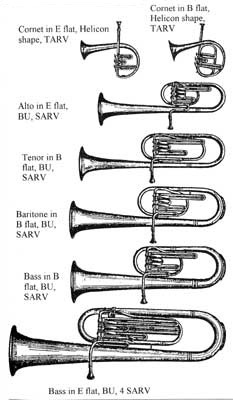 Included, of course, was the first tenor (alto) horn, but at this stage it was a keyed bugle; only the basses had valves. By 1850 he was selling a number of valved instruments, from a circular soprano cornet to middle brass to basses, that came both in an over-the-shoulder configuration, and in the more familiar bell-up configuration. Some of these instruments, like the tenor, baritone horn and basses, have changed little in their internal design to this very day. Generally speaking, Saxhorns are conical-bore instruments, using a cup mouthpiece, that belong to the cornet family, and range from the E flat soprano to the BB flat bass. A conical bore is a bore that is tapered throughout its entire length. The trumpet family of instruments, on the other hand, employs the use of a cylindrical bore. A cylindrical bore is a bore in which the sides of the tubing remain parallel, excepting within the lead-pipe and bell. Mouthpieces come in a number of designs. 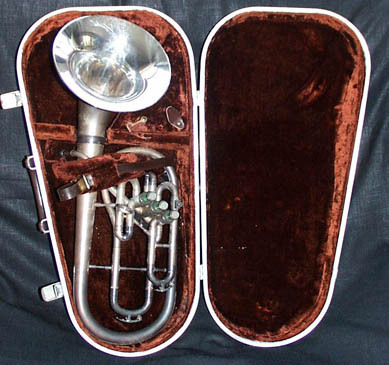 The ballad horn, “French” horn and Flugelhorn employ the use of a “funnel-type” mouthpiece. Most other brasswinds use a “cup” mouthpiece. A few common mouthpiece designs are: funnel, cup, “V”, parabolic, shaped or compound, screw-rim for changing rims and bowls, and “cushion” meaning wide-rimmed. The over-the-shoulder design of brasswinds with their bells pointing backwards seems an odd sort of convention today, but this design had a simple, practical purpose: as the band marched at the front of the army, in order for the soldiers to hear the band clearly so that they could march in step, Sax designed instruments that would direct the sound backwards toward them. Of enormous benefit to the musician was the fact that the balance of the instrument was perfectly centered over the middle of the shoulder. Another method of balancing the horn, of course, was to build it in the vertical position. In the auditorium and concert hall, this configuration has another beneficial feature: the sound rises and blends before projecting outward towards the audience, generating an homogenous sound. The modern tenor horn comes predominantly in two basic shapes: with the beginning of the bell tubing looping over top of the valves, a configuration normally associated with the cheaper models, and with the tubing wound once to leave the valve keys standing above the bell tubing, a trait normally associated with the more expensive models. The difference between these versions of the tenor saxhorn and the original lie mainly in the lead tube and bell-design. The original’s lead tube went directly into the first valve, then straight down once out the other side of the valve casing, shortly curving upwards, tracing an arc approximately 6.5" (17cm) across, with the bell extending both higher and lower than the modern version, sketching out a shape like a “b,” with a flared top. The modern tenor horn retains this general shape, but in compacted form, as the lead pipe goes directly to the valve casing, passes through, then straight down once out the other side, but this time, after dropping perhaps 10" (25cm), loops upwards once more, traces an arc of approximately 5" (13cm), drops down approximately 15" (38cm) before bending upwards, tracing an arc of approximately 6.5" (17cm), rising and ending at the bell. This design greatly shortens the height of the horn, whilst retaining all of the horn’s performance characteristics and intonation. Of added benefit is the fact that the instrument is more compact, easier to carry and transport, and is less prone to becoming damaged. 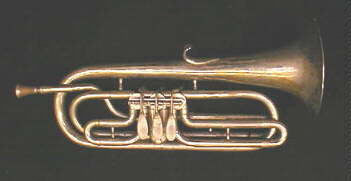 The bell of the modern Saxhorn also differs from the original, which more resembled a long, narrow cone ending in a small flare. The modern bell is wider, the bell tubing narrower towards the end. NOTE: The above numbers are only general averages, as there are many designs and shapes out there. The bell-forward design, though made sporadically and in small numbers, especially since circa 1910, is still very much with us today. The bell forward design was sometimes referred to as a “solo” horn, which is a reference to the British Brass Band tradition of referring to the principal tenor horn player as the “soloist.” The idea was for the soloist to be able to better project towards the audience. In the late 19th century, there were instruments whose makers billed them as being circular alto or tenor horns, but based upon the design of these horns, I think it can be safely said that this represents a misuse of the term alto or tenor horn, as the bore, taper and bell design are not a match. Some companies, like F. E. Olds & Sons, made tenor horns with directional bells that could be turned and, by means of screws, locked into place. Not all tenor horns are pitched in E flat. A percentage of the aforementioned Olds tenor horns were F horns that came with an E flat crook. 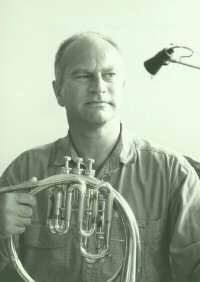 It is not presently certain as to how long F tenor horns have been made, but examples have been seen commonly since circa 1900. Antoine Courtois has been manufacturing tenor horns since winning a lawsuit against Adolphe Sax in 1855 for the right to manufacture Saxhorns. Their horns are among the finest, right along with the Besson Sovereign. Other manufacturers are: Amati, Bach, Cerveny, Kanstul, Yamaha.